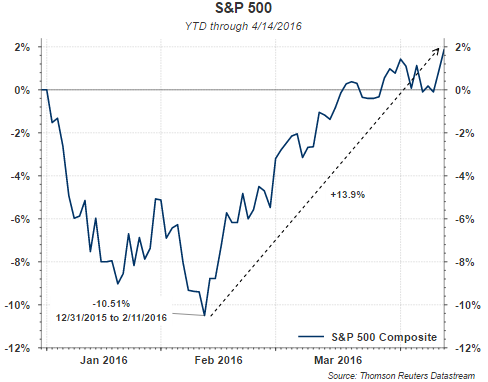 In our Spring 2016 Investor Letter published last week, we highlight aspects surrounding the volatile first quarter. Importantly, we discuss the year ahead and the silver lining of a slow economic expansion. There are newsworthy events on the horizon: the U.K.'s potential withdraw from the European Union (Brexit), timing of future Fed rate hikes and the U.S. presidential election. We discuss these topics and more in the Investor Letter. I once raced a Thistle sailboat we named Good & Plenty, after the pink and white licorice candy treat. I digress but that Thistle was one fast boat when the winds were good. With all the focus on oil, and after the morning release of the EIA Petroleum Status report today, it is evident the world is awash in Oil & Plenty of it. The current price of WTI Crude has recovered to a level last seen in November of 2015. The rebound in the price of WTI to the $42 per bbl area has had a positive impact on the stock prices of many of the energy related companies. 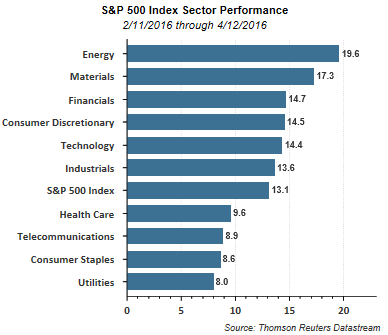 As the below chart shows, the energy sector within the S&P 500 Index has had the largest positive move off of the February 11, 2016 market low, i.e., up 19.6%. In a recently released report by S&P Dow Jones Indices, stock buybacks for S&P 500 companies declined 3.1% in the last quarter of 2015 versus Q3 2015. The biggest contributor to the buyback decline was the energy sector. Companies that comprise the energy sector reduced their buybacks by nearly 63% to $15,2 billion in 2015 versus $40.9 billion in in 2014. 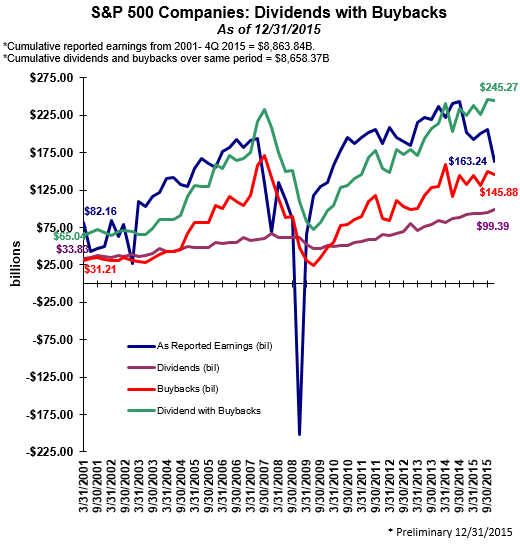 If the energy sector is excluded, buybacks for 2015 are up 8.7% versus a 3.4% buyback increase for the entire index. The buyback activity is far from dead as 24% of the index constituents reduced their company share count by more than 4%. Prior to the quarter's start, buyback activity was expected to decline on a year over year basis, yet this was not the case. For investors, the magnitude of the buyback activity by those 24% of companies does serve to artificially inflate earnings growth by 4%. When combining the dividend yield with the buyback yield for the S&P 500 Index, the combined yield is 5.51% at 12//31/2015 versus the 2.29% dividend yield alone. "On a sector basis, information technology continued to dominate buybacks even as its percentage of fourth-quarter buybacks decreased to 24.3% from 28.7% in the third quarter." "Energy continued to decline as the sector's expenditure declined 27.7% from the prior quarter. Consumer groups differed greatly as consumer staples increased its expenditure by 65.9% and consumer discretionary reduced its by 15.9%." "For the quarter, Apple Inc. again led with $6.9 billion spent on share repurchases, even though this is down 48.2% from its $13.3 billion third-quarter expenditure (which was the fifth largest ever posted by an index issue). United Technology Corp. came in second with $6.0 billion after buying back $1.0 billion in shares in the third quarter; Microsoft Corp. followed with $3.7 billion, down from $4.8 billion. Oracle Corp. and American International Group Inc. rounded out the top-five buyback spenders. ExxonMobil Corp. ranked 53rd, up from last quarter's 84th, with $0.7 billion (up from $0.5 billion last quarter), paling in comparison to $3.3 billion in the fourth quarter of 2014 when it ranked third." 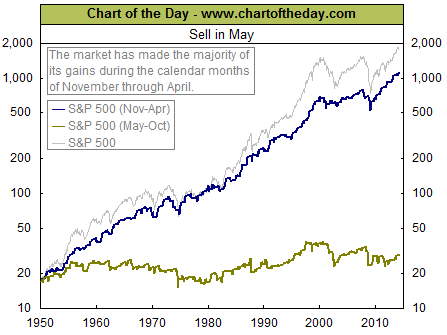 Absent the energy sector, the silver lining is dividend and buyback activity remains relatively strong. Companies would not continue returning cash to shareholders if they believed business activity was nearing a decline. Certainly, we prefer to see healthy dividend growth versus buybacks as dividends are more of a longer term commitment by a company; however, cash generation continues to look healthy.